There’s a restaurant in Toronto called Medieval Times. When I was a kid, I would see commercials for it on TV. The gimmick of this restaurant is that it’s set up like a large medieval hall in which patrons are entertained by knights sword fighting and jousting on real horses, all while eating medieval-esque fare without cutlery and drinking out of giant goblets. To my child self, it looked like the most awesome thing ever. Whenever the commercial (which was more like a movie trailer) came on, I’d stop whatever I was doing and imagine myself going to the restaurant. Unfortunately, because I was living in Nova Scotia, I never got to go. I still haven’t been to this day. Now, I’m writing a novel set in medieval England. My infatuation with Medieval Times restaurant isn’t the reason I’m doing this. The fact that this was just one of a whole series of similarly-themed childhood influences is. I’ve always been interested in ancient history, and medieval European history as it was romanticized in my childhood media sources was particularly appealing. 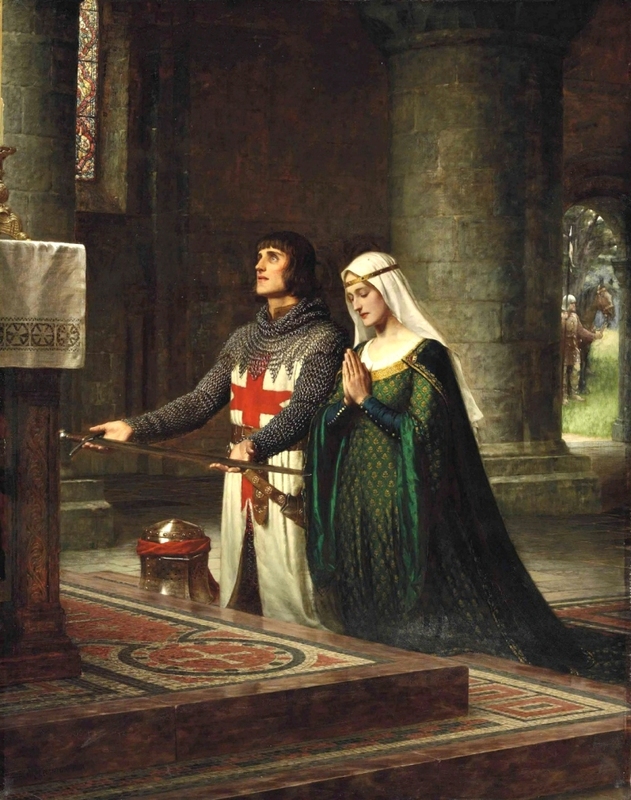 It was portrayed as a simple time – one where woman wore gorgeous flowing dresses, men carried swords to dispatch justice, people lived in or around castles, evil was localized, nature was undamaged, and a person could become a hero by doing the right thing. Did I mention the dresses? And the swords? 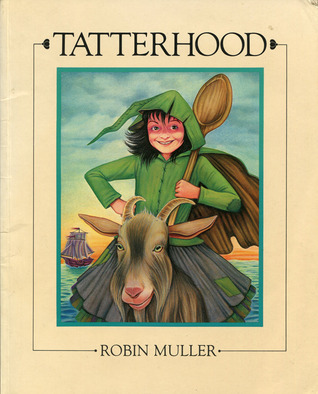 One of my favourite books as a child was called Tatterhood, by Robin Muller. This book was a work of fantasy, about a queen with two daughters: one was your typical sweet, obedient princess, while the other – the eponymous Tatterhood – was an eccentric, image-unconscious hellion who goes on a quest to battle evil witches (riding a goat and wielding a giant wooden spoon) after the witches place an terrible spell upon her sister. Tatterhood triumphs, and in the end finds love from a prince who is able to accept her as she is and recognize her inner strength and beauty. This sort of thing was typical of my reading tastes as a child. It was also typical of most of what was on offer for children my age growing up in a small city in the pre-Amazon, pre-Internet days of yore: fantastical, a medieval-esque setting, and related to the goings-on of royalty. A lot of the cartoons I used to like were set in medieval settings as well: the Smurfs, the Gummi Bears, Babar, He-Man and the Masters of the Universe, and She-Ra: Princess of Power to name a few. What I enjoyed most about Tatterhood was Tatterhood herself. She was a female character who did interesting things. Since the book was fantasy, she could do anything the author wanted her to do without concern for historical accuracy, which female fantasy protagonists to this day still often do. The Dedication, by Edmund Leighton (1908). But eventually, I grew curious at the setting’s source material – about what real women in the Middle Ages did, and what their lives were like. I always believed they did much more than what they were show to do in non-fantasy historical books and movies of the day – more than just pray, sew, poultice the wounded, lie around on their backs either awaiting the birth of a (hopefully male) child or for another less salubrious purpose, or generally serving as a prize for the heroics of a dashing knight. Maybe he just doubted my research skills. I got an A on that paper. The things I learned were incredible: medieval women did do interesting things. Not just things more commonly done by men, but their own unique, important work that was crucial to daily life in the Middle Ages, such as the active management of the castle, with all its myriad associated tasks. They did things that made it into the historical books and movies of my youth about as often as contemporary movies represents the full range of what modern women do. I also learned, unsurprisingly, that life in the Middle Ages, while simple, was also hard, particularly for women, as has been the case for much of history. And that castles were drafty as hell. The novel I’m writing is now a combination of both my early childhood influences and my adult understanding of the world, both past and present. It’s wholly a story of my history, even though, in my clearly not being of European ancestry, it’s technically not my history at all. And as I continue to move through my life – continuing to grow and change and have new experiences – perhaps a different time period, a different place in the world, and an entirely different focus will see me leaving a different trail of history behind. Now it’s your turn: What influences from your childhood help inform your writing today? Tell me about it in the comments. This entry was posted in Building a History, Writing and tagged Books, Cartoons, Childhood influences, Fantasy, Feminist fiction, Historical fiction, Medieval times, Novel, Novel writing, The Middle Ages. Bookmark the permalink. Your question at the end got me thinking… and thinking. And I’m alarmed to say I can’t answer it. My childhood interests were Star Trek, Space 1999, Doctor Who, classic monsters, and Godzilla, and Dr. Seuss before that. I do like to write (allegedly) humorous verse, but I don’t see how any of that affects my fiction today. I suppose that the person I was when I wrote the first time, when I was a tween and a teen, no longer exists. This modern phase of writing must be influenced by something else. Hmmm. This reminds me of a Doctor Who episode. There’s some sort of invisible creature whispering in my ear and telling me what to write. Watch out, earth. Something about my combination of words will turn you all into Cybermen. Ever since our point-counterpoint, I’m feeling creative about marketing and publicity! Watching that Medieval Times commercial made me want to go there all over again. As soon as my nieces are a bit older, we are so there! I’m certain that the tweens and teens we all were don’t exist anymore. That’s one of the cool things about writing: each story is kind of like a time capsule of who we were and how we perceived the world at the time (unless you’re like me and write your novel over a six-year period, in which case it may contain the soul of three or four different you’s). But sometimes the creative influences come later in life, and sometimes it’s not any one particular work in its entirety, but a patchwork of many little pieces from here and there. Dianne, as soon as my nieces are older, I’m totally taking them to Medieval Times. I may well enjoy it even more than they do! I want to go to that restaurant. ^_^ I hope they do it A Knight’s Tale style. Back to the question posed though. There are significant influences of my childhood on my current novel series, but most of them happened in my daily life and not so much the stories I was reading, though some come from there. I definitely came away with a love of fantasy from reading and rereading The Chronicles of Narnia. My favorite book was A Horse and His Boy. I wanted a talking horse and I wanted one bad, even if it did bite me and say rude things. Also and influence on me would be the dozens and dozens of Landmark history books I chewed through, historical accounts of men like Captain Jones, Captain Cortez, George W. Carver, Kit Carson, and Julius Caesar as well as women like Clara Barton and Dolly Madison. It was a one sided history, but my love of history from then led me to explore other sides of human development later. My mother ran a garden in our large side yard and other places for most of my younger years, which definitely informed the use of plants, trees and dirt in my work. We also kept chickens, turkeys, large dogs and cats and lived side by side with a variety of dangerous and not so dangerous wildlife, including coyotes, mountain lions, hawks, rattle snakes and scorpions. I did a lot of hiking and running around mountains sides near preserves in southern California. My mom read me Laura Ingals books and I thought that they’d happened like maybe thirty years before. My characters have a strong attachment to the land, or at least some of them do, but they know that nature can turn and kill them as well. My love and trust towards dogs definitely comes from that time period. Whoops, this was a long comment. I’ll knock off here. Good post! I was always very interested in historical time periods (about how the society functioned) but less so about specific people from history. This is probably reflected in the fact that all the main characters in my WIP are fictional, with real historical figures only getting a mention here or there (not even a full-on cameo). That’s cool that you had such a “rustic” upbringing. I didn’t become close to the land until I studied ecology in university and went on to work for the national park service and essentially live in the wilderness. Now that I don’t work for them anymore, my closeness had definitely drifted, though not altogether disappeared. I don’t think I can ever 100% assimilate into an urban setting now. My first (incomplete, shelved) novel featured the land prominently. I really want to try to rework that story someday. I’ve never been able to connect with just broad brush strokes of history, but individuals and close ups, stories and anecdotes from the times do draw me and help me remember it. I read quite a few G.A. Henty books growing up like Under Drakes Flag and For the Temple. The books were extremely well researched and accurate but followed a fictional youth character through the timeline. I can remember things about Titus, the Roman general who stormed the Temple in Jerusalem even a dozen years later. I don’t think I could ever write a fictional book based on a real life historical figure. I appreciate it when its done well, but I’d sweat the details until it was no fun to write! Hope you do rework that novel someday. The land really does add something to narratives in my mind. One of the best books I’ve read is Naomi & Deborah Baltuck’s ‘Keeper of the Crystal Spring’ which is set in medieval times. If your novel is anywhere near as good it will be a winner. As to your question, the common denominator from childhood to now has been sport – but it’s never occurred to me to write about it. OK my first novel ‘Barry’ was written around a central theme of distance running but that wasn’t a childhood thing. I guess all my major influences have kicked in later in life. You’ve mentioned this book to me before, Roy; I’m going to search it out. As to sport, perhaps it influenced your writing in other ways, i.e. not with stories literally about sports, but the core lessons and values associated with sport, such as team work, discipline, dedication, etc.